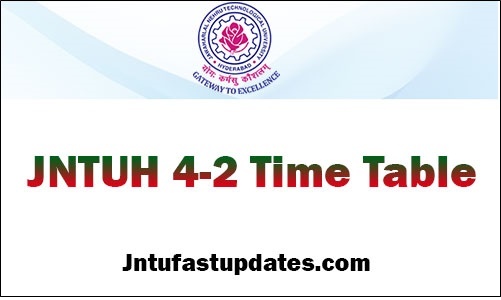 JNTUH 4-2 Time Table 2019: JNTU Hyderabad B.Tech 4-2 Sem R15, R13, R09 Regular/Supply Exam Time Tables May/June 2019. Students can download JNTUH 4-2 time tables 2019 from links given below. JNTU Hyderabad has announced B.Tech 4-2 Semester R15, R13, R09 Regular/Supplementary Examination time tables May/June 2019. Students can check their JNTUH 4-2 time table R15 or JNTUH 4-2 time table R13 or JNTUH 4-2 time table R09 from below links. JNTUH is going to be B.Tech Regular/Supply Examinations from 6th May, 2019. Keep visiting the JNTUH Official portal to check the time tables. Jawaharlal Nehru Technological University Hyderabad (JNTUH) is one of the largest university that offers various graduate and post graduate degree courses for the students. The JNTUH is one of the biggest universities of Telangana. It offers affiliation for various Engineering, Medical, and other professional educational institutions in Telangana. JNTU Hyderabad follows semester system in organizing the examinations. That is, JNTUH conducts the academic examinations yearly twice for various courses. Lakhs of students pursuing under JNTUH annually. It monitors and regulates the education and examination process in the state of Telangana. The JNTUH is going to conduct the 4-2 Semester examinations in the month of May/June for all the years and branches of B.Tech. Aspirants obtaining the education under JNTUH can check the JNTUH B.Tech 4-2 time table 2019 from its official portal, jntuh.ac.in. The exams will be conducted as per scheduled dates. JNTUH is going to conduct the examinations in various colleges affiliated to it. The regular and supplementary examinations will be held at a time. 1. Visit the JNTUH Official website, jntuh.ac.in and log in to the site with user id and password. 2. On the homepage, students can find various latest notifications from the university. 3. In the recent notifications, students can find the link of JNTUH B.Tech 4-2 time table 2019 May. 4. Click on the link, and the time table gets downloaded in PDF format. 5. Check the time table clearly to check the exam dates. 6. Take a printout of the date sheet to have the further reference. Sir evertime before 1 month u release the timetable sir.exams are from 6th may means on April 5th u realease the timetable now remaining 20 days left for exams.when u will release the timetables for R13 regulation….SIR ANY POSTMENT OF EXAMS?REPLY SIR…. Sir em papam chesam sir roju ila tension pedtunaru. Plssa twaraga 4-2 advance supply results release chyandi pls.. Please release 4-2 advance supply results. Today is 1st August , and u guys told that result we will be last week of July ???? Please sir or mam please release 4-2 advansed supply results plzz we had pgecet councilling so plzz release our results out plZzz as soon as possible. Sir its a kind request to u please relase the 4-2 advance suplly result for b.pharmacy as we hve to go for certifict verification an pgcet cou silling begore 4 auguest sir …. I request you that pls released the results o 4-2 advance supply results soon & request to all jntuh professor pls keep mercy during the checking copy of the student that written advance supply… I hope u will do good results this year … I shall be obliged to you for this ….